Although today is Thanksgiving and debatably (is that even a word?) the best Holiday ever, it is also another very special day – my Mom’s birthday. Every few years, her birthday falls on this day, and I wanted to do some special things for her. That’s the reason I love cooking – on special days you can make people happy by making them something that brings them joy. When I saw this recipe for Chocolate Goat Cheese Truffles I knew this would be my mom’s “Birthday Cake.” Like me, she loves goat cheese. Mixing it with chocolate sounds weird, but this turned into the easiest and tangiest chocolately truffles you’ll ever make. Happy Birthday to the best Mom ever! I know you’re making the turkey today and doing probably over half of our Thanksgiving meal (recipes to follow! ), but I Love You and hope you get to relax on a day that is normally filled with chaos for the master chef! Place about 2 inches of water in a small saucepan, and place chocolate in a heatproof bowl. Set the bowl over, but not touching, the simmering water to melt the chocolate. Once the chocolate is melted, remove bowl from the pot and set aside to cool slightly. In a medium bowl, whisk together goat cheese, melted chocolate, sugar, vanilla, and peppercorns until fluffy and well incorporated. Cover the mixture in plastic wrap and refrigerate for 1 hour or until firm. Once firm, portion a heaping teaspoon of the goat cheese mixture into clean hands and roll into a ball. 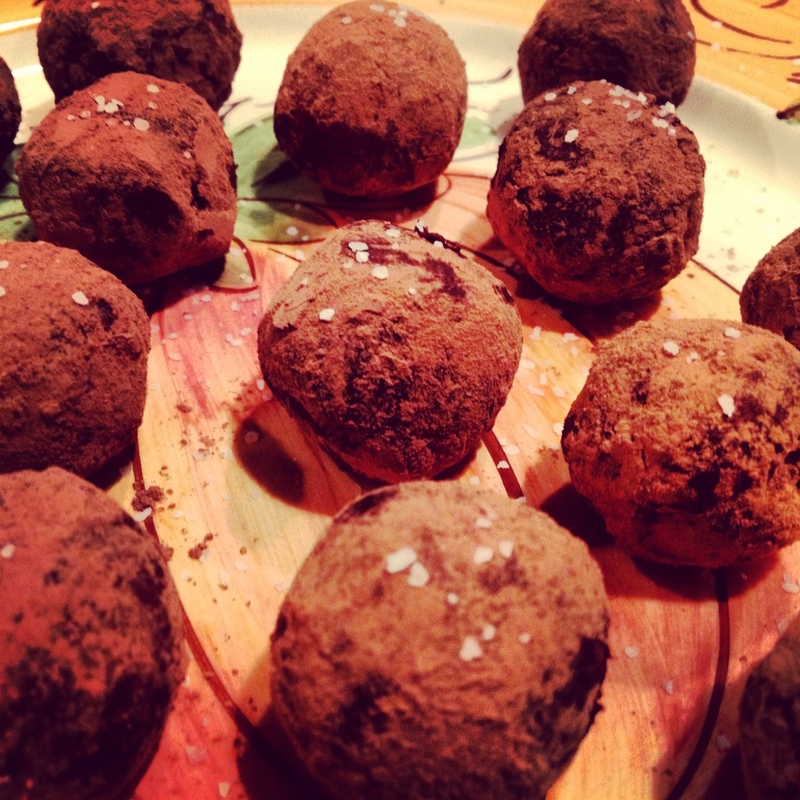 Coat the ball in cocoa powder, place on a cookie sheet, and top with a few flakes of coarse sea salt. Serve slightly chilled. 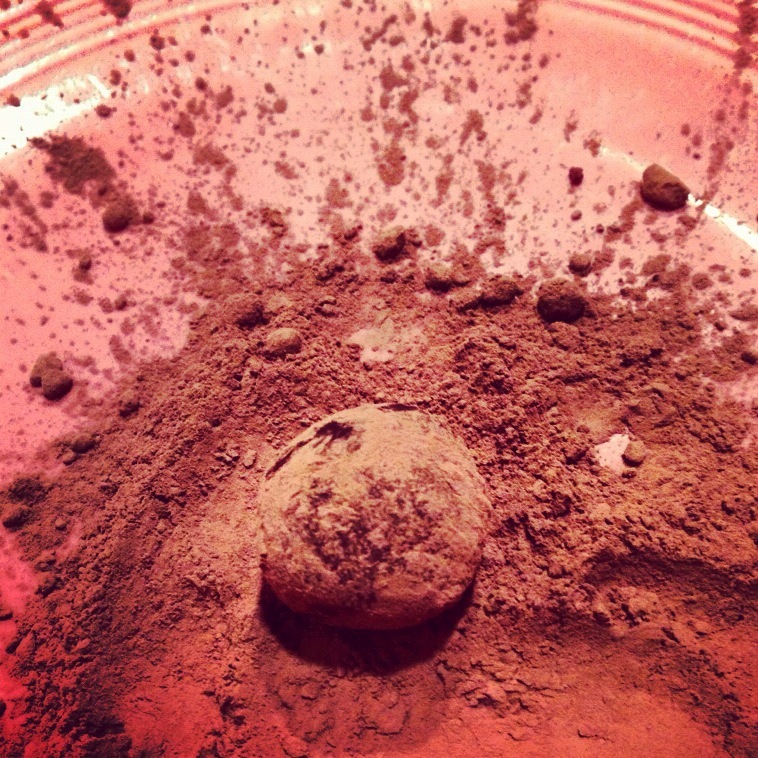 Truffles will last, in an airtight container, in the refrigerator for up to 3 days. Happy Bitthday and many, many more wonderful Birthdays in the future!! These may be the best truffles that I ever had! The recipe sounds a little strange but they are amazing! Thanks for the great “birthday cake”!! !